U.S. Files Criminal Charges Against Chinese Officials Over Cyberspying : The Two-Way The Justice Department accuses five Chinese officials of stealing trade secrets by spying using military and intelligence facilities. These are the first charges of their kind to be made by the U.S.
Press materials are displayed on a table at the Justice Department in Washington on Monday before Attorney General Eric Holder was to speak at a news conference. The United States has for the first time filed criminal charges against foreign government military officials in connection to cyberspying allegations. The Justice Department is accusing five Chinese government officials of using military and intelligence facilities to steal trade secrets from U.S. companies, including Alcoa Inc., Westinghouse Electric Co., United States Steel Corp., and Allegheny Technologies Inc. In a televised press conference Monday, U.S. Attorney General Eric Holder said this is the kind of behavior that the U.S. "categorical denounces." "The success of American companies, since our nation's founding, has been the result of hard work and fair play by our citizens," Holder said, adding that success should not come through the efforts of state-sponsored spying. "The Obama administration has long considered China the most aggressive nation in obtaining industrial secrets through spying. 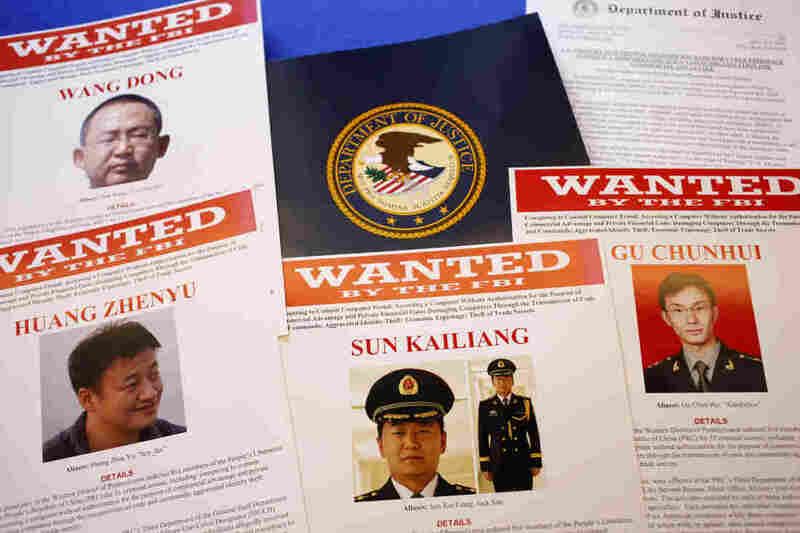 "'Chinese actors are the world's most active and persistent perpetrators of economic espionage,' said the Office of the National Counterintelligence Executive, a U.S. government agency, in a 2011 report. "A year ago, several U.S. newspapers, including The New York Times and The Wall Street Journal, said hackers traced to China attacked their newsroom computer systems." During his press conference, Holder said the United States does not collect intelligence to help U.S. companies. But it's worth noting that former NSA contractor Edward Snowden claims that the U.S. engages in industrial espionage. In an interview with German TV station ARD in January, Snowden said the NSA does not limit its spying to issues of national security. "If there's information at Siemens that's beneficial to U.S. national interests — even if it doesn't have anything to do with national security — then they'll take that information nevertheless," Snowden said. It's not clear whether Snowden was referring to trade secrets, as well. China dismissed the charges as "made up." Reuters reports China's Foreign Ministry said the charges would "damage Sino-American cooperation and mutual trust. "China is a staunch defender of network security, and the Chinese government, military and associated personnel have never engaged in online theft of trade secrets," Foreign Ministry spokesman Qin Gang said, according to Reuters. During the press conference, Assistant Attorney General for National Security John Carlin said the U.S. has brought these kinds of incidents to the attention of the Chinese government, who responded by publicly challenging the U.S. to bring forth concrete allegations. "Well today, we are," said Carlin. "For the first time, we are exposing the faces and names behind the keyboards in Shanghai used to steal from American businesses." Carlin went on to explain two examples laid out in the indictment: In one case, said Carlin, a U.S. company called SolarWorld was losing market share to Chinese competitors who were pricing exports below costs. At the same time, Chinese hackers were "stealing cost, pricing, and strategy information" from SolarWorld. In another instance, Carlin alleges, Chinese hackers stole trade secret designs, while Westinghouse was "negotiating with a Chinese state-owned enterprise over the construction of nuclear power plants." "To be clear, this conduct is criminal," Carlin said. "And it is not conduct that most responsible nations within the global economic community would tolerate." "Defendants : Wang Dong, Sun Kailiang, Wen Xinyu, Huang Zhenyu, and Gu Chunhui, who were officers in Unit 61398 of the Third Department of the Chinese People's Liberation Army (PLA). The indictment alleges that Wang, Sun, and Wen, among others known and unknown to the grand jury, hacked or attempted to hack into U.S. entities named in the indictment, while Huang and Gu supported their conspiracy by, among other things, managing infrastructure (e.g., domain accounts) used for hacking. "Victims : Westinghouse Electric Co. (Westinghouse), U.S. subsidiaries of SolarWorld AG (SolarWorld), United States Steel Corp. (U.S. Steel), Allegheny Technologies Inc. (ATI), the United Steel, Paper and Forestry, Rubber, Manufacturing, Energy, Allied Industrial and Service Workers International Union (USW) and Alcoa Inc."